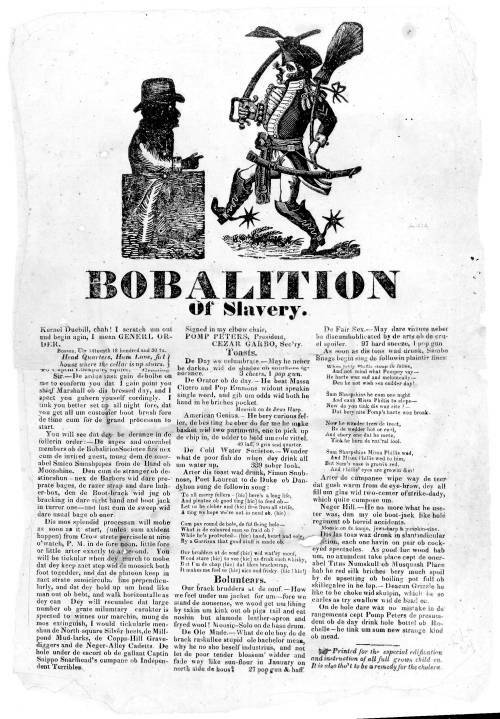 Another in the series of "bobalition" broadsides, marking the July 14 celebration of the anniversary of the abolition of the slave trade. (See no. 1819-2). The text, facetiously dated "Uly 14teenth 18 hundred and 30 tu," consists of a letter to "Captain Ookpate" from "Pomp Peters" and "Cezar Garbo" regarding the celebratory procession, along with notes on toasts, volunteers, etc. The broadside is illustrated with a cut of a standing black man facing right and another caricature of a strutting militiaman armed with a cutlass and broom.